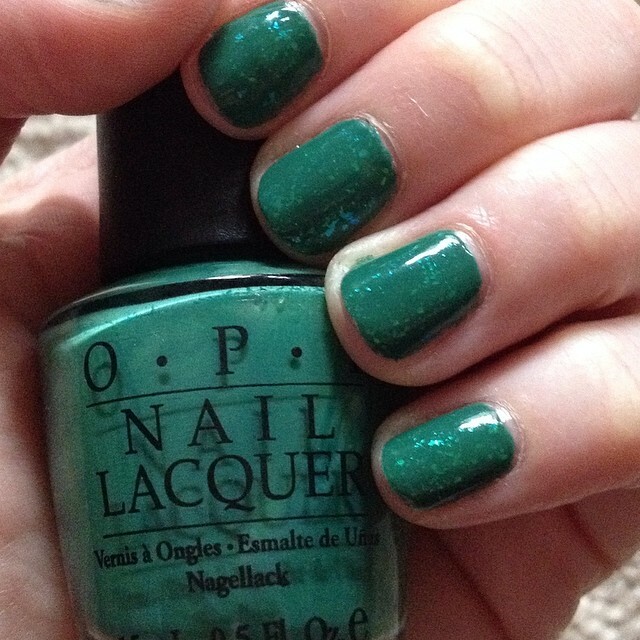 The Beauty of Life: #ManiMonday: (Almost) St. Patrick's Day Green Nails with OPI and Zoya! #ManiMonday: (Almost) St. Patrick's Day Green Nails with OPI and Zoya! So, here's the thing. I may be Jewish, but I love sporting manicures that celebrate pretty much every holiday. Christmas, Easter, you name it, my nails are celebrating it. And St. Patrick's Day is just a really easy one, especially considering how much I already love green nail polish! So this time around, I went for a little sparkle with OPI and Zoya. Over the weekend, I went to Completely Polished in Cranberry for a little mani-pedi action. After the awfully cold winter we've been having, my hands and feet were in need of some serious love. And, while I brought my own polish (as per usual), my eyes strayed to the greens on the nail polish rack. All of a sudden, a light bulb went off inside my head. Why not combine two fabulous colors into one even more fabulous mani? And so today's manicure was born. I started with two coats of one of my all-time favorite polishes, OPI Jade Is The New Black ($9 at drugstore.com): a creamy, opaque green that never fails to impress (or disappoint). To spice things up a bit, I added one coat of Zoya Opal, a limited edition (and sadly no longer available) holographic green flakey from the Spring 2012 Fleck Effect Collection. The result? Holographic, glittery goodness that's making it impossible for me not to stare at my nails minute after minute! What's on your nails for the upcoming St. Patrick's Day festivities? Let me know in the comments!